Ordering a ride should never be frustrating. That’s why we created eRide, an automated bookings program for hotels, bars, and restaurants that makes getting a ride as easy as possible, especially in situations that might not be easy. With eRide, your establishment can quickly order a taxi without ever having to talk to an operator. This saves you valuable time and potential frustration so you can keep everything under control. We can set up your location so your employees can automatically book rides by calling or texting. 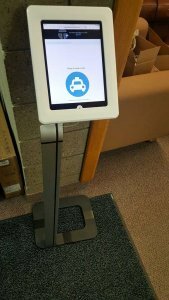 If your location books a higher volume of rides, then we can supply a kiosk-based iPad where you or your customers can simply tap the screen to book the ride. You can track the ride from the iPad or from a text that is sent directly to the customers phones when the booking is created. Call our sales department at 763-592-6410 to learn more about how our eRide programs can help you better serve and protect your patrons. To serve you in the fastest and most efficient way, we send orders to the closest vehicle in the Transportation Plus network that suits your request. Look for the T-Plus top light or sticker in the front windshield. I wanted to compliment your driver. He was a very nice guy and his taxi was the cleanest one I have ever seen. Thank you very much.